Whats your story? Meet Alannah-Jane! Welcome to the first part of this new section of my blog, where we hear a little more from other people living with an IBD. This is Alannah-Jayne, who I met through the #GetYourBellyOut campaign. We started talking and I realised how inspirational this person is. When I planned this part of my blog I really wanted to get her involved, and wanted to share her story with you. She also writes her own blog, alannahjaynesblog.wordpress.com, which is well worth a read. So enough from me, and time to hand you over to Alannah-Jayne to tell you a little about herself. Hey everyone! 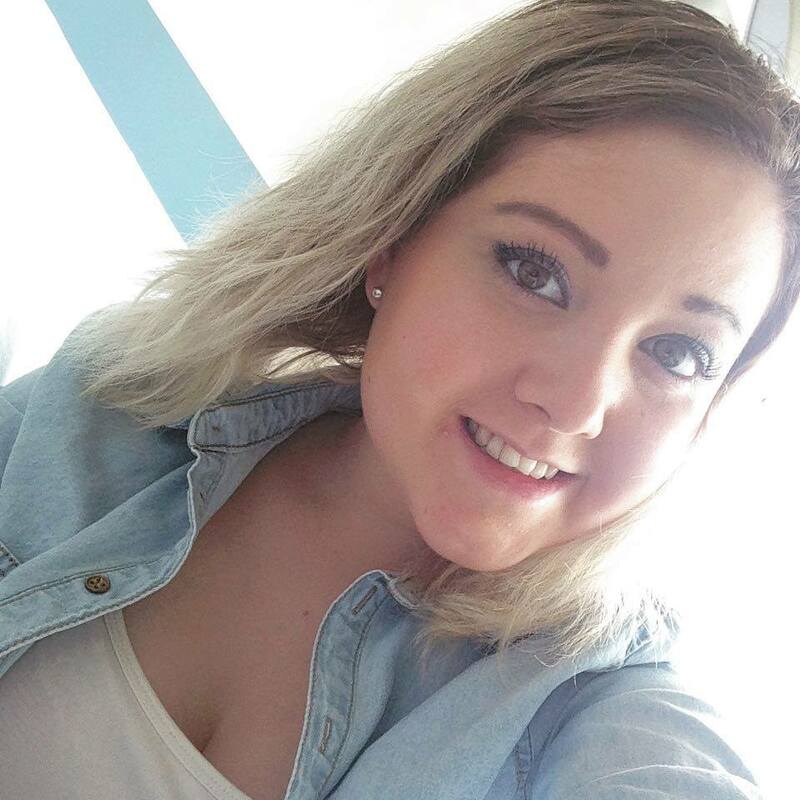 I’m Alannah-Jayne and this is my short story on my journey with IBD! At the age of 14 I suffered from terrible stomach pains, time of the month, migraines and bowel movements from one extreme to the other. It wasn’t until I turned 17 that it became much worse and started to control my everyday life. In three months I had lost a lot of weight, going from a size 10 to a size 4. I would spend every day without fail on the toilet and at nights I would black out from the pain and hit my head on the back of the toilet and lay there until my mum would find me there in the morning. In August 2012 I finally got a colonoscopy and it was confirmed straight away I had Crohn’s and was given a course of steroid treatment. However, two days later I was rushed in from losing a huge amount of blood and had my first ever admission into hospital which was in my opinion: horrendous. I’m now 20 years old and have spent most of my year in hospital. I had a lifesaving operation for a Stoma which is a permanent Ileostomy and I called it ‘Lola’. This is just the first part of the operation and I am currently waiting for the second which is to remove my rectal stump, where my active Crohns Disease and Ulcerative Colitis still lurks. The pain is unbearable some days and it can be really difficult to motivate myself sometimes. Through the help of family and friends I manage to cope a little better and I have adapted to my stoma very quickly! My stoma nurses, specialists and GP’s are shocked as to how quickly I have become independent with Lola. I am 3 months post op at the moment and I always concentrate on a goal for the future which is to become a stoma nurse! I have modelled for Kemunto fashions in my nearest town Aberdeen to raise awareness, been in my local paper (the Huntly express) and Keith local paper (the Banffshire Herald) and also the towns paper (the press and journal) all to raise awareness about Crohn’s and Colitis and how far I’ve come. I am now also telling local hospitals, shops and people about #getyourbellyout and that having IBD is something to be proud of and not embarrassed or ashamed of. I am now raising awareness to be even more confident and raise awareness for people with a stoma bag! As I’m sure you’ll agree, quite a person. 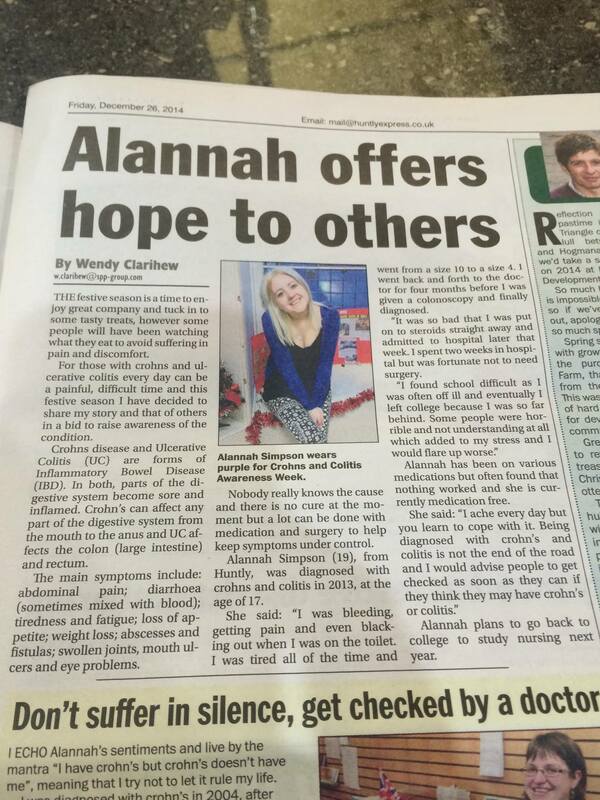 Thanks to Alannah-Jayne for sharing her story with us. If you have read this and also would like to share your story, then please get in touch. Have a great day everyone! This entry was posted in What's your story? and tagged Crohn's Disease, Crohns and colitis awareness, Crohns and Colitis UK, IBD awareness, Positive thinking, Stoma, Ulcerative Colitis. Bookmark the permalink. 2 Responses to Whats your story? Meet Alannah-Jane!